The West End location is excellent. Step inside and everything at the Kenilworth is designed to make you feel special – that means superior service and luxury levels but all without pretension. The mood is lush and calming with Cambodian and Chinese artefacts and sculptural displays of tropical flowers. All rooms are individually designed and totally clutter-free. Bedrooms have African walnut beds and wardrobes, bespoke Dixon Turner wall coverings, Percale cotton bed linen and two-tone blue silk curtains. Bathrooms are clad in Sicilian Carrara marble with Jacob Delafon sanitary & bathware. Security is high with CCTV, throughout, and floor access is by room key only. Advanced guest technology includes Bang & Olufsen TVs, High speed internet and guest controlled air conditioning. Suites feature Edouard Rambaud furniture, silks from Noblis Fontan, Phillipe Stark bathroom suites and Bose sound system. The largest parks in the central area of London are the Royal Parks of Hyde Park, its neighbour Kensington Gardens at the western edge of Central London and Regent’s Park on the northern edge. Regent’s Park contains London Zoo, the world’s oldest scientific zoo, and is located near the tourist attraction of Madame Tussauds Wax Museum. Closer to central London are the smaller Royal Parks of Green Park and St. James’s Park. Hyde Park in particular is popular for sports and sometimes hosts open-air concerts. A number of large parks lie outside the city centre, including the remaining Royal Parks of Greenwich Park to the south-east and Bushy Park and Richmond Park to the south-west, as well as Victoria Park, East London to the east. Primrose Hill to the north of Regent’s Park is a popular spot to view the city skyline. London’s buildings are too diverse to be characterised by any particular architectural style, and have been built over a long period of time. Many grand houses and public buildings, such as the National Gallery, are constructed from Portland stone. Some areas of the city, particularly those just west of the centre, are characterised by white stucco or whitewashed buildings. Few structures pre-date the Great Fire of 1666, except for a few trace Roman remains, the Tower of London and a few scattered Tudor survivors in the City. Wren‘s late 17th century churches and the financial institutions of the 18th and 19th centuries such as the Royal Exchange and the Bank of England, to the early 20th century Old Bailey and the 1960s Barbican Estate form part of the varied architectural heritage. The disused, but soon to be rejuvenated, 1939 Battersea Power Station by the river in the southwest is a local landmark, while some railway termini are excellent examples of Victorian architecture, most notably St. Pancras and Paddington. The density of London varies, with high employment density in the central area, high residential densities in inner London and lower densities in the suburbs. The Monument in the City of London provides views of the surrounding area while commemorating the Great Fire of London, which originated nearby. Marble Arch and Wellington Arch, at the north and south ends of Park Lane respectively, have royal connections, as do the Albert Memorial and Royal Albert Hall in Kensington. Nelson’s Column is a nationally-recognised monument in Trafalgar Square, one of the focal points of the city centre. High-rise development is restricted at certain sites if it would obstruct protected views of St. Paul’s Cathedral. Nevertheless, there are plans for more skyscrapers in Central London (see Tall buildings in London), including the 72-storey Shard London Bridge, which will be one of the tallest buildings in Europe. Development temporarily stalled as a result of the recent financial crisis, but is reported to be recovering. Older buildings are mainly brick built, most commonly the yellow London stock brick or a warm orange-red variety, often decorated with carvings and white plaster mouldings. In the dense areas, most of the concentration is achieved with medium- and high-rise buildings. London’s skyscrapers such as 30 St Mary Axe, Tower 42, the Broadgate Tower and One Canada Square are usually found in the two financial districts, the City of London and Canary Wharf. Other notable modern buildings include City Hall in Southwark with its distinctive oval shape, and the British Library in Somers Town/Kings Cross. What was formerly the Millennium Dome, located by the Thames to the east of Canary Wharf, is now used as an entertainment venue called The O2 arena. London is the capital of England and the United Kingdom, the largest metropolitan area in the United Kingdom and the largest urban zone in the European Union by most measures. London has been a major settlement for two millennia, its history going back to its founding by the Romans, who called it Londinium. London’s ancient core, the City of London, largely retains its square-mile mediaeval boundaries. Since at least the 19th century, the name London has also referred to the metropolis developed around this core. The bulk of this conurbation forms the London region and the Greater London administrative area, governed by the elected Mayor of London and the London Assembly. London is a leading global city, with strengths in the arts, commerce, education, entertainment, fashion, finance, healthcare, media, professional services, research and development, tourism and transport all contributing to its prominence. It is the world’s largest financial centre alongside New York, has the largest city GDP in Europe and is home to the headquarters of more than 100 of Europe’s 500 largest companies. It is the most visited city in the world. London’s five international airports make its airspace the busiest of any urban centre worldwide and London Heathrow is the world’s busiest airport by number of international passengers. London’s 43 universities form the largest concentration of higher education institutions in Europe. In 2012 London will become the first city to host the Summer Olympics three times. London has a diverse range of peoples, cultures and religions, and more than 300 languages are spoken within its boundaries. In July 2007 it had an official population of 7,556,900 within the boundaries of Greater London, making it the most populous municipality in the European Union. The Greater London Urban Area is the second largest in the EU with a population of 8,278,251, while London’s metropolitan area is the largest in the EU with an estimated total population of between 12 million and 14 million. London contains four World Heritage Sites: the Tower of London; Kew Gardens; the site comprising the Palace of Westminster, Westminster Abbey and St. Margaret’s Church; and the historic settlement of Greenwich (in which the Royal Observatory marks the Greenwich Meridian (0° longitude) and GMT). 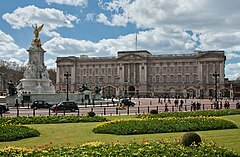 Other famous landmarks include Buckingham Palace, the London Eye, Piccadilly Circus, 30 St Mary Axe (“The Gherkin”), St Paul’s Cathedral, Tower Bridge and Trafalgar Square. London is home to numerous museums, galleries, libraries, sporting events and other cultural institutions including the British Museum, National Gallery, British Library, Wimbledon and 40 theatres. London’s Chinatown is the largest in Europe. The London Underground network is the oldest underground railway network in the world and the most extensive after the Shanghai Metro.